This episode was much better than last week’s! I was hoping we wouldn’t be disappointed two weeks in a row. As always, let’s start off with the Easter Eggs. The most obvious Easter Egg was the numbers. But what do they mean and why are the associated with those Losties. Did you see her? No not Rose, but the woman who went to go get Rose was the fortune teller that Hurley visited. Locke’s alarm clock sounded like the alarm from the Swan. When Locke fell out of his wheelchair at the beginning of the episode and the sprinklers went off, he smiled. This seemed to mirror the first time it rained on the island where he sat out in the rain and smiled. The wall of names – Anyone notice that Kate was not on there. Remember, Kate did not do what Jacob asked her to do (stop stealing) so maybe that took her off the list of being a canditate. And there was only one Kwon. I am going to assume at this point that it refers to Jin and not Sun. Sun was not transported back on Oceanic 6 like the rest of the Losties. Maybe only men can protect the island. OR Kwon could be in reference to their baby. Only time will tell. 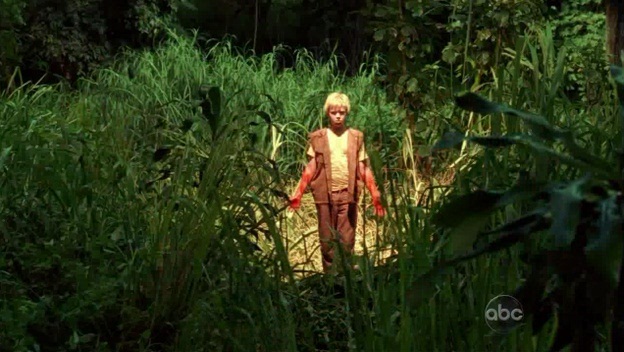 So who do you think the little boy is that Flocke and Sawyer saw? At first, I thought it was Jacob at a young age. But then I got thinking this morning and thought maybe it was Aaron (the little Prince). Don’t know how he would have got there but maybe he’s like Walt and can appear to people. The kid that appeared to Flocke reminded him that he “couldn’t kill him.” Who is he referring to? Sawyer? Flocke/MIB wants to cross off ALL the candidates names but he can’t kill Sawyer. He was able to cross off Locke since someone else killed him. Richard? He obviously wasn’t happy that Richard wasn’t going to go along with him. Flocke told Richard that you normally do not get 2 chances. Then the boy showed up. Also, when Flocke was chasing the boy, Richard came to talk to Sawyer. Jacob? But didn’t he already kill him? Why did Ilana take Jacob’s ashes? I think she may try to bring him to the Temple and reincarnate him. Or maybe that will help him take on someone’s body. And now for my favorite line of the night. Sawyer: Well I guess I better go put some pants on. Thanks for stopping by my blog the other day 🙂 i am currently watching season 3 of LOST i wanted to know what all the hooplaa was all about and now i am addicted to it! I skipped all of that and when straight to the comments! just came across your blog…LOVE IT. and i'm a huge lost fan too!! ha ha – cute idea! I love seeing pictures taken by kids because you really do get a sense of their perspective. It's kind of scary to look up at adults.